La Roux has returned. After a five-year hiatus, the singer has come back armed with a new, softer look and a new song, “Uptight Downtown.” The first single from her upcoming album, “Uptight Downtown,” epitomizes the tough, slinky dance pop sound of Trouble In Paradise, set to come out July 8. La Roux kicked off a North American tour this week at the Danforth Music Hall in Toronto, Ontario. This leg of the tour will include stops in Boston, Philadelphia and Washington D.C., before wrapping up at the Music Hall of Williamsburg in Brooklyn on June 11, the same day La Roux performs “Uptight Downtown” on ABC’s Good Morning America. 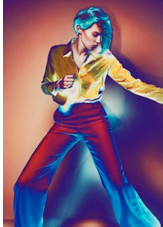 La Roux will play a string of West Coast dates in July, including two support shows for New Order. Listen to “Uptight Downtown” below.